The Marc 2013.1.0 release is focused on advanced material modeling, damage and fracture mechanics, accurate and easeof-use in contact simulations, dynamic and multiphysics simulations. 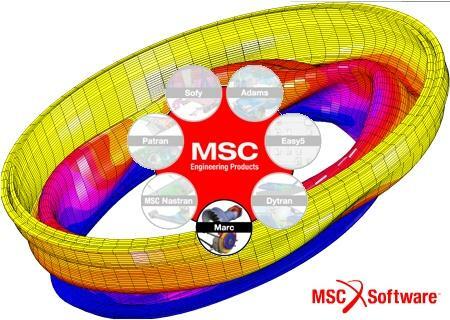 Built upon the strong formulation of the Marc product it provides the ability to solve complex models in the aerospace, automotive, civil engineering, structural, energy, and bio-medical industries. Note: The Marc 2013.1.0 installation procedure is different than previous releases. The Marc documentation for both Windows and Linux is provided in a separate installer. This was done to facilitate download time. Please be sure you install both the software and the documentation. Documentation should be installed after the software so Mentat can access it properly.